Located in the sought-after Seaside Estate at Fern Bay, this stylish and modern semi-detached home offers everything needed to enjoy a peaceful, relaxed and premium lifestyle. With luxury features, ample living space and being located only walking distance to the pristine sands of Stockton beach, your new dream lifestyle awaits. Stepping inside on the lower level you will find the spacious open plan kitchen, living and dining area with large modern floor tiles and down lights throughout. Your new kitchen which overlooks the dining space boasts stone bench tops, stainless steel appliances and ample cupboard space. The perfect place to prepare meals for your guests. Located in the living area is your reverse cycle air conditioner to ensure you and your family can relax in year round comfort. Leading out from the dining area is the covered alfresco and low maintenance fenced lawn area, the ideal area for your furry friends to relax when they’re not off exploring the local parks and trails with you. 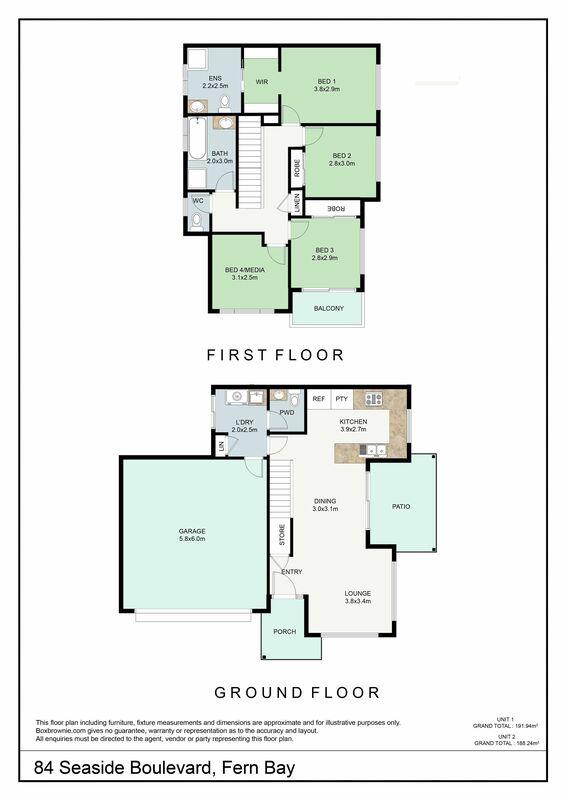 On the upper level you will find the four bedrooms, the master with walk through wardrobe leading to the private en suite and two further bedrooms with built in wardrobes. The fourth bedroom would be ideal as a guest space, media room or additional living area. All bedrooms have ceiling fans and in the master you will find an additional reverse cycle air conditioner. Located off the upper level landing area is the spacious family bathroom with separate bath and shower. The separate toilet is located alongside. With other quality inclusions such as double lock up garage with internal access & auto door, laundry with external access and rainwater tank this home has everything needed to move in and enjoy. The location of this home is superb, being positioned in a popular spot close to a number of parks, playgrounds and cycle ways, as well as close to trails which lead to the beach. Newcastle CBD is only a short 20-minute drive away.